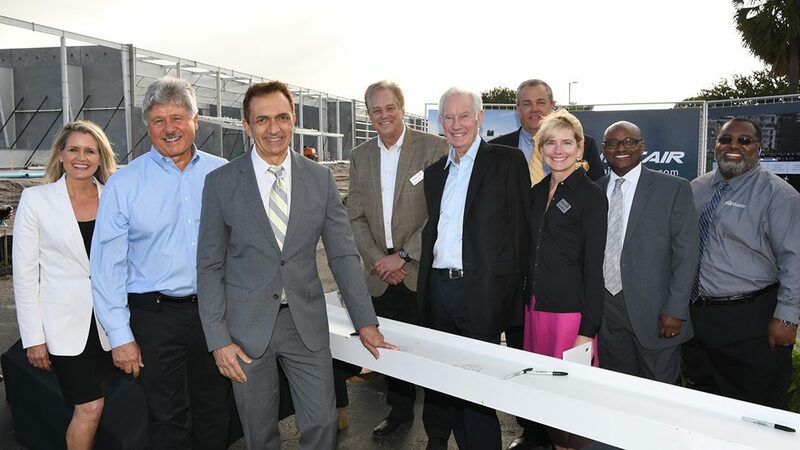 Participants in the event included Fort Lauderdale Mayor Dean J. Trantalis, Fort Lauderdale City Commissioner Heather Moraitis, Sheltair Aviation chairman, CEO, owner and founder Gerald M. Holland, and Banyan President Don Campion. Construction is proceeding on a state-of-the-art 207,000 square foot hangar and office complex that will include eight hangars that can welcome large cabin-class sized aircraft, and an additional 31,000 square feet of office and shop space. The complex will also be the home of Banyan’s Northside FBO terminal, allowing them to meet the needs of an expanding, exclusive clientele that insists on professionalism and privacy for their travel arrangements. Fort Lauderdale Executive Airport (FXE) serves as a gateway for executive and private aircraft traveling to and from the Caribbean, South America, and other international airports. The Airport houses more than 1,050 aircraft and handles nearly 170,000 takeoffs and landings per year, ranking it as one of the top five busiest general aviation airports in the U.S. A variety of amenities and services are available at FXE including four full-service, fixed-base operators, a 24-hour Federal Aviation Administration Air Traffic Control Tower, U.S. Customs and Border Protection with Global Entry and Automated Passport Control kiosks, 24-hour aircraft rescue and firefighting station, a Fort Lauderdale police substation and 24-hour security. The Airport also owns and operates a 200-acre Industrial Airpark, Foreign-Trade Zone #241, and the John Fuhrer Helistop. For more information, visit www.flyfxe.com.